Dr. Arash Azarbal discusses how applying a conservative approach to dentistry and utilizing the most advanced techniques and materials available can achieve a superior aesthetic and functional result. Pasadena, CA — Advances in technology have allowed dental professionals to preserve more of the natural tooth and gum tissue than ever before, Pasadena dentist Arash Azarbal, DDS reveals. He says utilizing a conservative dental approach in combination with these many innovations can help to restore and maintain patient oral health as well as provide cosmetic benefits with long-lasting results. To help individuals researching general, restorative, and cosmetic dental procedures, he offered a helpful resource on how conservative dentistry plays a vital role in optimizing the health, function, and beauty of the smile. Dr. Azarbal highlights the cosmetic benefits of conservative dentistry by revealing how advances in technology make it possible to improve tooth alignment, color, and shape with minimal risk of damage to natural healthy tooth structure. “In conservative cosmetic dentistry, our ultimate goal is to achieve ideal smile design by eliminating visual tensions and preserving tooth structure and restoring ideal aesthetics and function.” Treatments like porcelain veneers, Invisalign®, and Zoom!® teeth whitening can be customized and refined to minimize the need for reduction of healthy natural tooth structure and achieve the best results possible, he affirms. 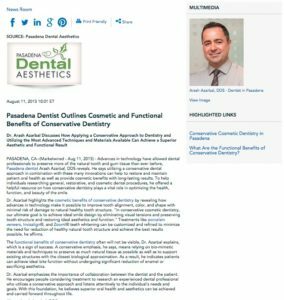 The functional benefits of conservative dentistry often will not be visible, Dr. Azarbal explains, which is a sign of success. A conservative emphasis, he says, means relying on bio-mimetic materials and techniques to preserve as much natural tissue as possible as well as to support existing structures with the closest biological approximation. As a result, he indicates patients can achieve ideal bite function without undergoing significant reduction of enamel or sacrificing aesthetics. Dr. Azarbal emphasizes the importance of collaboration between the dentist and the patient. He encourages people considering treatment to research an experienced dental professional who utilizes a conservative approach and listens attentively to the individual’s needs and goals. With this foundation, he believes superior oral health and aesthetics can be achieved and carried forward throughout life. Dr. Azarbal is an extensively trained dentist and the founder of Pasadena Dental Aesthetics. He earned his undergraduate degree from the University of California, Los Angeles followed by his Doctor of Dental Surgery (DDS) degree from the University of Southern California’s Herman Ostrow School of Dentistry. Following graduation he completed his general practice residency at the New York Department of Veterans Affairs. In addition to being an active member of several esteemed dental organizations, he is also a certified Level 2 Invisalign® Premier provider. Dr. Azarbal is part-time faculty at the USC School of Dentistry and one of the preclinical course directors in DMFE (Dental Morphology Function and Esthetics) under Dr. Pascal Magne, considered a leader in bio-mimetic and cosmetic dentistry. Dr. Azarbal is available for interview upon request. For more information about Dr. Azarbal and his practice, please visit pasadenadentalaesthetics.com and facebook.com/pages/Pasadena-Dental-Aesthetics-Arash-Azarbal-DDS/155437344496718.